Substitutions: Sameh Maraaba, Jonathan Cantillana, Ahmed Maher Wridat, Odai Kharoub, Pablo Tamburrini, Yashir Pinto Islame. 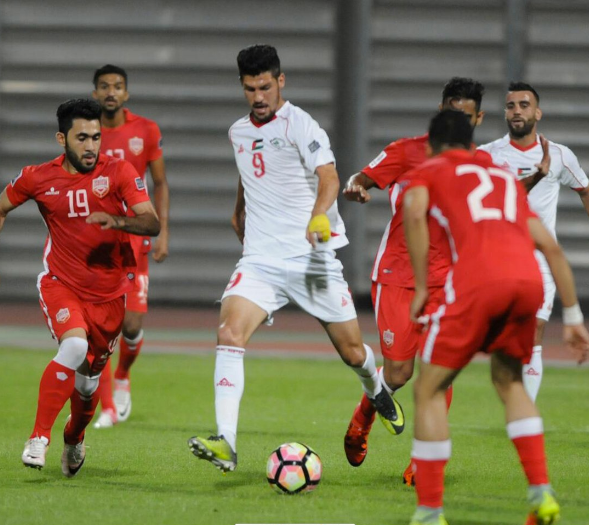 Recap: Palestine emerged victorious late Tuesday night in a friendly encounter versus their Bahraini counterparts. The match was shrouded in secrecy with Bahrain manager Miroslav Soukup requesting the match not be televised. Bahrain were by far the better team in the first half but failed to parlay their advantage into goals. The woodwork cruelly denied Al-Ahmar the opening goal on three separate occasions. Palestine on the other hand, struggled to create chances mustering zero shots on target in the opening half of the game. Despite not providing any sort of attacking threat Abdel Nasser Barakat persisted with a formation that fielded three similar players in the middle of the pitch. There was an added irregularity in this formation with Alexis Norambuena vacating his right back position to play as a right-sided midfielder. Palestine's breakthrough would come with their first shot on goal. Khaled Salem vindicated Abdel Nasser Barakat's faith in him by scoring his first ever international goal in an official senior match. The Hilal Al-Quds player spent much of the season shuttling around positions but was given the start ahead of the likes of Matias Jadue and Yashir Pinto. As Bahrain flooded forward to find an equalizer- Palestine doubled its lead through substitute Sameh Maraaba. The win is Palestine's third straight and maintains their 100% record in 2017. Hamadi, Cleansheet King: Rami Hamadi became only the second player to start his national team career with three clean sheets. Factor in unofficial matches he's gone over 360 minutes without conceding for the national team. The record for longest shutout streak belongs to Ramzi Saleh (504 minutes May-September 2014) but if Hamadi can repeat the feat next week he could conceivably break the record when Palestine play host to Maldives in November. What's Next: Palestine will host Oman in Al-Ram. Kickoff is set for 11 PM local.